For many years I have been communicating about my ideas on training horses, both in clinics as on the internet and social media. As a result I became quite experienced in dealing with criticism and opinions. This inspired me to write this article. Riders have different values, beliefs, rules, references and ideals when it comes to horse training. Plus, they have different levels of consciousness. And all this affects their way of and perspective on training horses. Now for centuries, these difference causes disagreements, controversies and feuds in the horse world. The most important things in life for rider A are success and feeling important and this rider wants to avoid the feelings of failure at all times. For rider B the most important things in life is love and feeling accepted and this rider wants to avoid the feelings of rejection at all costs. So rider A values success over love and Rider B values love over success and for rider A failure is worse than rejection and for Rider B rejection is worse than failure. As a result of this value difference, rider A might easily sell his horse (when he’s not successful with it and fails too often) and rider B will never sell his horse (because he loves his horse dearly and doesn’t want to reject the horse). So a different set of values lead to different approaches. What do you value most in life, what is your number #1 value? Success, love, passion, freedom, peace, adventure, security, integrity, loyalty, faith, hope, gratitude, grace, growth, compassion, trust, pride, creativity, authenticity, …? 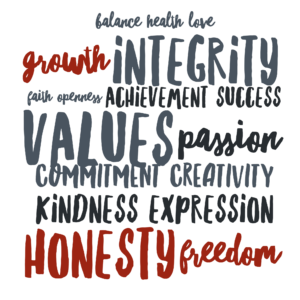 What is your top 5 values? What is most important for you to feel, which emotions give you most pleasure? Feeling successful, feeling loved, feeling free, feeling peaceful, feeling safe, feeling playful, feeling happy, feeling proud, feeling knowledgable, ….? These are also called ‘towards values‘. What are the feelings you would do almost anything to avoid having to feel, which emotions give you most pain? Feelings of failure, rejection, anger, frustration, loss, humiliation, boredom, loneliness, vulnerable, feeling unloved, insignificant, unimportant, ignored, unworthy….? These are also called ‘away values‘. 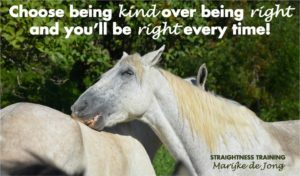 Your toward and away values will influence your view on horse training and when you meet riders with other values, you might not always agree with their approach. Beliefs: what do things mean? The belief that holding horses in captivity and training horses to alter their behavior is not ethical. The belief that training horses is fun and it stimulates the horse mentally and physically and enriches the horse’s life. The belief that you don’t have to be certified to teach somebody else. The belief that you need to be a Dr. or Ph.D. before you are allowed to teach. The belief that you only need feel, intuition, common sense and the art of training to be able to train a horse. The belief that you must use the absolute truth of equine science and the laws of learning to be able to train a horse. The belief that the horse training world is using incorrect and outdated scientific learning concepts. 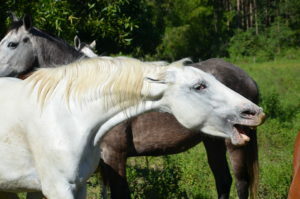 The belief that horses live in hierarchy and interact with clear dominance and subordination. The belief that horses live in partnership and that the theory of dominance and leadership is outdated. The belief that training a horse with pressure and release is outdated scientifically seen. The belief that there is nothing more natural and easy to understand for a horse than pressure and release. The belief that the word punishment means harming the horse in the worst sense of the word. The belief that the word punishment is just a word choice to explain a scientific concept. 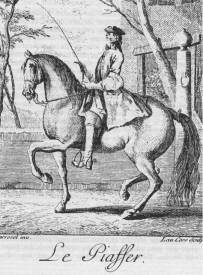 The belief that the use of a whip automatically leads to forcing a horse to submit. The belief that a light tactile cue with a wooden stick is something else than doing pressure and release with a whip. The belief that negative reinforcement is the same as positive punishment. The belief that mixing reinforcement and punishment leads to frustration. The belief that you best train a horse with isolated exercises. The belief that you best train a horse with compound exercises. The belief that the water bucket is half full. The belief that the water bucket is half empty. So what does things mean? 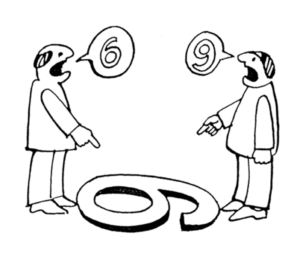 That differs from rider to rider, it depends on what they think that certain words, facts, ideas and concepts mean. It also depends on their level of consciousness. The most important thing in training horses is…. 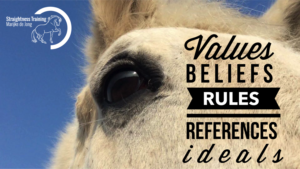 Our beliefs will influence your view on horse training and when we meet riders with another belief system and other meanings, we might not always agree, and we might feel the urge to convice the non-believers and to prove them wrong. Especially when we live on the ‘blue’ level of consciousness. Painful experiences are often the root to form pessimistic beliefs. Pleasurable experiences are often the root to form optimistic beliefs. When a rider has fallen off a horse many times in the past, he might have started to believe that horses are unpredictable. If rider has had many pleasant rides, this rider might have started to believe that horses are the most wonderful creatures on earth. When a rider has had a couple of instructors that where all a bit harsh with horses and the horses were more or less suppressed, his belief might now be that any kind of pressure is always wrong. But if a rider met instructors who mastered the art of timing and dosing of pressure and release and had fantastic partnerships with their horses, this rider might have developed the belief that pressure is very useful and valuable in training horses. 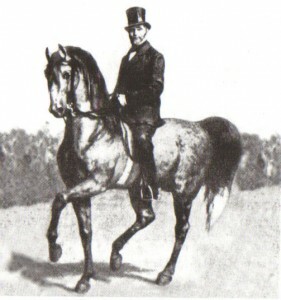 At the time the rider was a novice horse trainer and the timing and dosing of his guidance were not appropriate, his horse often misunderstood his requests and therefore became opposed, starting to push, pull, nip and eventually bite. In order to solve this issue, the rider developed an ‘avoidance’ strategy by not using any pressure at all and only treats. It worked: he got rid of the issues and therefore formed the belief from this one experience that pressure is wrong and that his one-concept-only approach is the right way and the only way. Another novice rider with the same issues continued on another path and decided to refine and master his pressure and release technique and to develop his motivation skills and to train more than one horse, which lead to beautiful results. So he might have formed the belief that he wants to have all tools in the tool box so he can adjust to the horse that is in front of him. So most of the time your past colors your beliefs and because everyone goes his own journey in life, you’ll meet many riders with different experiences and references and therefore different views and perspectives on the world of horse training. And especially when these beliefs are deeply ingrained, because of past experiences, it might lead to strong opinions. • What is good and what is bad, what is right and what is wrong. • What we should do and what we must do. • What others should do and what others must do. • What has to happen in order for us to feel good. A rider must wear a helmet, because the insurance company says so. A rider should always have a free choice to wear a helmet or not. Using pressure on a horse is bad and outdated. Using pressure is good and natural. When a training approach is scientifically proven, it’s right. The mainstream training approach in all equestrian disciplines is wrong. You must use advanced equipment to measure if the saddle fits. The only thing you can 100% rely on is your senses, your intuition and common sense. All riders must see, hear, agree and acknowledge my way as the one and only true way. What other riders think of my way is none of my business. Often riders judge other riders through their set of rules. And some riders get very emotional when their rules are violated and as a result they start to preach their absolute truth, sometimes wherever they can (in other peoples barns, on other people’s internet forums, pages, groups), especialy when they operate on the blue level of consciousness, And if they don’t feel seen and heard, they might drop down to the ‘red’ level of consciousness and start to condemn, patronize and ridicule the non-believers. Riders have different rules about helmets, whips, treats, approaches, techniques, etc. And many riders think that their set of rules are the right rules, and that there’s only one way and that’s their way. They would say for example: “If you truly loved a horse, you would never do…” in order to make them more empathetic and kind than others. But rules are made to be broken — and that’s exactly what other riders do, they break other people’s rules. Therefore you might get upset when somebody violates your rule, but it’s just a ‘rule-upset’ it’s nothing personal. However, it might trigger that you get very emotional about it, because it also affects your values. With your rules you can hit your target, your#1 value, because rules determines what has to happen for you in order to feel loved, safe, significant, succesful, free, grateful, happy, or whatever your #1 (towards) value is. Now you can have easy rules to hit your target, but you can also have rules that don’t make it so easy. I must be recognized by other riders as being the best. Everyone must like me and agree with me. My horse must be able to do the most difficult exercises. My approach has to be acknowledged as the best. So when all these rules are met, he will feel succesful. Everyday above ground is a succesful day! So for which rider it’s probably more easy to feel successful? Then the good thing is that we can change our rules when they become a bit too unreasonable or when they make our relationships with other riders (or even our horse) difficult. We can always redesign our beliefs and rules in a way that it makes it easy to feel ‘good’ and difficult to feel ‘bad’. 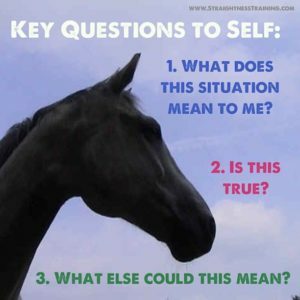 Another important factor in what influences your choice on the direction you wish to take on your horsemanship journey, are the dreams, desires, goals and ideals you have. Is the ideal life with your horse to have a healthy, happy horse that you can go on a trail with? Or would you like to be able to jump 1.60 m? Or reach the top in competitions? Or is your ideal to be able like to work with multiple horses at liberty at the same time? Is your ideal to have the piaffe perfectly on the spot without any forward movement? Or should it be performed with one hoof print forward in your ideal picture? And should the front legs be vertically straight in the piaffe and the nose slightly in front of the vertical? Or is your ideal picture a horse with the nose behind the vertical? Is your ideal path to stick to one method? Or do you want to mix and match and take the best out of everything? 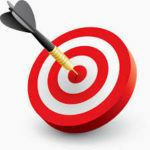 What are your goals, dreams, desires and ideals? Already for centuries riders differs in ideals and the ways to get there, which causes disagreements and controversies. But more ways lead to Rome and not everybody has Rome as the ideal; they want to end up in Paris, or London or New York. 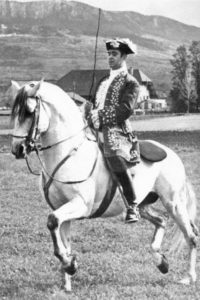 “On an artistic level, the difference between classical riding and sports dressage is similar to ballet and gymnastics: the two are nice and good, they touch each other, but it’s not the same.” But nowadays, sports riders still argue with classical riders about who is ‘right’ and who is ‘wrong’. 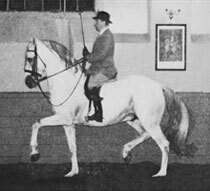 Also within the classical schools there are many schools, where for example the School of Légèreté differs as much from the Academic Art of Riding as from the Spanish Riding school. It’s the same with classical music: there’s baroque music from Vivaldi and Bach, classical music from Mozart, Beethoven and Brahms, romantic music from Chopin, Lizt and Strauss and nationalistic music from Tchacikovsky and Dvorak. It’s all classical music, but with a different ‘flavor’ and ‘color’ and ideal. Also the background of the composers and their approach differed: Beethoven was not nearly as talented as Mozart as a child; Vivaldi started to play music in a church, Brahms in bars and brothles; Handel was very skilled at the organ, but Lizt was one of the most talented pianists the world has ever seen and he was so grandiose with his concerts that he ordered a second piano be on stage in case he were to break the first one while playing. But back to the horse word, where an Icelandic rider will never argue with a show jumper on how to train a horse, because they know they differ in ideals, views, beliefs, rules and perspectives. However, the closer things start to look, the more people have the tendency to develop the need to convince each other from what is the ‘right’ and ‘wrong’ ideal and the ‘right’ and ‘wrong’ way to get there. In the Renaissance, Antoine de Pluvinel didn’t agree with Frederico Grisone, both were head-master of a riding academy. In the Classical era Gustav Steinbrech (left picture) and François Baucher (right picture) where ‘rivals’ as much as music composer Mozart was a rival of Salieri. 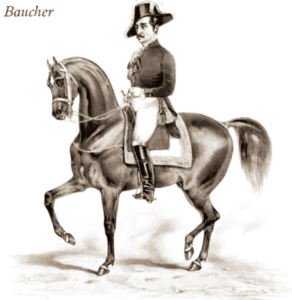 Steinbrecht was applied the traditional compound exercises such as the lateral movements, where he worked the horse’s body in unity and harmony, and Baucher invented new isolated exercises where he worked single parts of the body. At the end of many chapters in Steinbrecht’s book ‘Das Gymnasium des Pferdes’ he writes about how he completely didn’t agree with Baucher’s training approach. In the 20st century grandmasters Egon von Neindorf (left picture) and Nuno Oliveira (right picture) were also rivals. They both had a horse from the same blood line but didn’t agree with each other’s training approach. So over centuries there has been disagreement about values, beliefs, rules on how to reach the ideal and not only in the horseworld, also in many other industries. In the music industry the Baroque composer Handel and his Royal Academy of Music were extremely popular, but Handel had to deal with lots of envy and rivalry, which put Handel’s academy out of business and bankrupted him twice. But even ‘within’ a style there’s rivalry: the Beatles feud is an example. John Lennon and Paul McCartney were openly critical of each other’s music and had many disagreements. It was one of the main reasons the Beatles ended. And there will always be ballet feuds: the Royal ballet vs the English National Ballet, Bolshoi in Moscow vs Mariinsky in Sint Petersburg, Stuttgart ballet vs Hamburg ballet, etc. resulting in many social media ‘wars’. In the dog world there’s the controversy between +R trainers and ‘dog whisperer’ Cesar Millan who also uses +P. Many ‘modern’ vetenarians fight the ‘outdated’ methods of treatment of television vetenarian Dr Pol. In the fitness/health industry it’s Crossfit vs Body building, Pilates vs Yoga, Feldenkrais vs Alexander technique. So it’s not only the horse world that is dealing with controversies! And besides this, in each equestrian discipline it occurs: in the sports dressage world, the natural horsemanship world, in the classical riding world, in the western world. In each school or method, riders will speak about their way following their rules, based on their scienctific research and their own experiences. Until the ‘camps’ do not agree to disagree, value-beliefs-rule-ideal-upsets will keep popping up and ‘believers’ and ‘dedictates’ keep starting never-ending discussions on the internet about who is ‘right’ and who is ‘wrong’, where some people would rather be ‘right’ than happy. It’s probably the smartest to agree to disagree, because it costs more to fight it out than to resign to the fact that history repeats itself. Yet people still choose to spend all their time and energy on social media, especially on other peoples accounts and timelines, just to get recognition and conformation from other readers or to collect as many ‘likes’ as possible that will prove they’re ‘right’. Whatever you do, you will always bring your own values, beliefs, rules, references and also your expectations and ideals to the table. And the good thing is, that when you know your values, beliefs, rules and dreams and desires you can choose an approach to training horses that suits you and your horse best, and make a choice on the direction you wish to take on your horsemanship journey. And what’s great is, that you have all these choise options and to stay open to learning from others who show great results with the ambassadors of their approach: their own horses.! It’s also great that each method and each riding master offers something valuable and that you can still learn from those that you don’t necessarily admire, even if that means you learn ‘what NOT to do’. And if you decide not to follow their path, you can agree to disagree, but still show mutual respect, at least for the honor of their horses. Since no two horse trainers are the same, it would be a waste of energy to try to convince each other of a single true way. Just go your own path, and use the power of the internet, which is a great place to connect with like-minded riders. So start a website, start a Youtube account, create a Facebook page or join an excisting Facebook group with kindred spirits, to share your insights, photos, videos and to chat about things with ‘believers’. With the variety of values, beliefs, rules and ideals that excists in the horse world, it’s far more productive to stop talking and start doing and to share the fruits of your training efforts on your own platforms, to walk your talk and be the change you want to see. Actions speak louder than words! Some of these points are spurious, or false, logic. At one point people thought that the earth was flat. From the point of view of an earth bound creature this made sense. Yet it has been shown that the earth is spherical and this is true no matter what you vantage point. The same applies to horse training. The difference being it’s not vantage point but language. The underlying nature of the horse is what it is, no matter how you try to express it. Then there are observable facts. If you think the issue of “dominant hierarchy” for example is bunk, you are completely ignoring observable facts. The world is spherical no matter how you express it, or where you are standing, we now have observable facts from astronauts. I suppose that some still hold on to the conspiracy theory. I could go on but you get the drift. Hi Dan Thomas. I agree to disagree 😉 Nevertheless I hope that we can meet one day…in the land of studying human nature in relation to the horse. Without exploring the nature of the horse there will be no progress in human relations to this fantastic creature. “The underlying nature of the horse” is NOT “what it is”, Dan Thomas. As long as people continue to claim they own the only truth in this matter, we will not grasp the `astronaut´ viewpoint of `the earth´/this matter. So, to get to the moon and to make a step on it, we need to grasp articles like the one Marijke wrote about “Agree to disagree”. We should try to understand all what she wrote above, although it is a bit complex and a bit demanding to concentrate on. 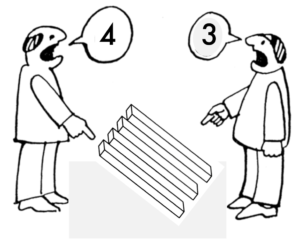 When read with an open mind we can start to compare it with our (old) point of view. By comparing these two statements like scientists would do (if they dared to deal with non-measurable matters), we can get deeper into the matter. The horses deserve it. In this way, I become more knowledgeable and more able to make wise choices for my horses. The examples of controversies in the world of dance, music etc. were great. Perhaps all the discussion, and differing points of view eventually take us to a deeper, more nuanced, more mature understanding of our endeavour? “Methods vary, Principles do not.” Principles do not belong to mankind, they are not man-made. There cannot be “sides”. There is only one side, it is the side of the horse. Only the horse will honestly express what is right and what is wrong, through his body and mind. Catherine, these are beautiful and very true words: There is only one side, it is the side of the horse. There will always be people that disagree with your beliefs, and that’s ok. That’s their journey. This well written, well thought out and very well presented article goes so much deeper than horses and riders, wish there were more positive minded people in this world-what a wonderful place it would be then. time, knowledge, sharing and caring attitude to life.